I usually visit Liam before the shift changes at night. However, my mom hasn't been able to watch Noah in the afternoon for Clint and I to go together so Clint went after work and then I went after the shift change which is around 8. Since I've never been at night I've never met any of the staff. It was great to meet some of the other nurses who have been taking care of Liam. Liam and I started kangaroo care. We didn't cuddle for more than a few seconds and they already had to adjust his oxygen. I know it's common in preemies but it still makes me feel bad that whenever we get to be near each other he doesn't seem to tolerate it well. I don't want to bore you with all the medical terminology (and I know I won't explain it well) but the monitor kept on beeping because of the saturation so it was best that we put Liam back in his isolette. Within seconds his levels came up to normal once he was back in his snuggly spot. As much as I wish I could hold him all day and every day, I know that he is still so early that he wants to be snuggled up in his cozy bed because it feels like the womb. Hopefully we will be able to snuggle again soon. I'm going to try every other day and see how it goes. After a few minutes of being back in his isolette, he started having another bradycardia episode (which is when his heart rate drops very low). I was there and was able to rub his back while he came out of it but man it's so scary. I don't think I'll ever get used to it! 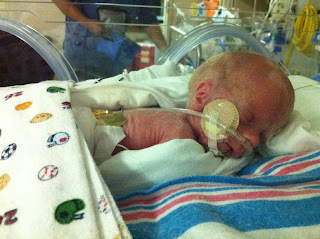 Since the NICU was so slow, I asked one of the nurse practitioners TONS of questions. She explained how well he was doing to be off the ventilator so soon and to be tolerating feedings. I asked her what tests are coming up and she said at 4 weeks they are given an eye exam so next week we will do that. I also asked when will they introduce the bottle and that happens at 34 weeks and that's Thanksgiving day! She explained to me that the biggest things we are working on is for him to continue to tolerate his feedings and they are now fortifying it to get more calories so he can continue to gain. I can't wait till he gets to 2lbs! Here is a picture from him today. When I posted it on Facebook everyone noted how much bigger he looks, so that's great! Check out his light hair. Mary, your strength astounds me. You are an incredible woman and Liam and Noah are both such lucky fellas to have you as their mom. I am praying for Liam. He is already doing so well masha'Allah- he is a living miracle.